Let's say the tube has a inside diameter of 1 inch; at 60mph this device would deliver roughly 28 cubic feet per minute of air to the airbox neglecting any funneling effect. It can't hurt really. With engine bay temps as high as they are, the extra air, even at 100 degrees is relatively cool. It's similar to the Ram-Air pontiacs they used to make, only the air isn't being forced into the filter. Those used suction to pull the air at low speed and then gained a few horses when running. Dyno it with a big *** fan, I'd like to see it. Suggestions though, use a more funneled shape, collect air from a larger area, and use even larger tubing. Larger Area= more air. Let's say the tube has a inside diameter of 1 inch; at 60mph this device would deliver roughly 28 cubic feet per minute of air to the airbox neglecting any funneling effect. We brainstormed this idea for our Baja Car in SAE. Last edited by UR2EZ; 10-30-2008 at 06:38 PM. 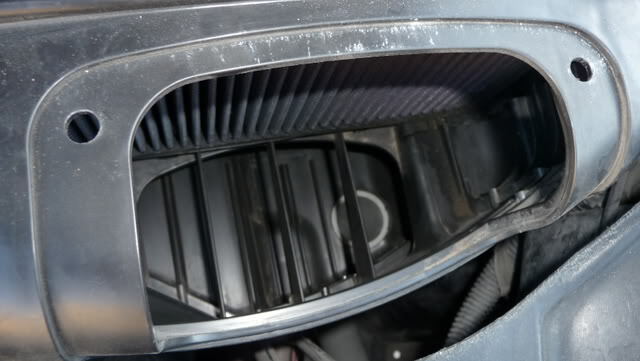 I am just wondering why the majority of the tuning companies use this air to cool brakes, not divert it to the intake. Dyno it with a big *** fan, I'd like to see it. Church's new fan blows 70+ mph! I am all in favor of this mod just becuase it is a DIY... and I'm all about that! It's not colder air, no matter how much these guys want to convince themselves that it is. air intake after the MAF sensor is an issue and care should be taken to control it (IMO) - and we all know that’s all about more o2 molecules for better combustion... will this affect that? Possibly, but not horribly (for ppl like me that have done about everything else, little things become a target area). In THIS case though... its not the air temps after the MAF that you are concerned about - you want the MAF sensor to read cold air... anything before the sensor that is bringing in hot or making intake air hotter is a bad thing because the ECU reads air temps from the MAF sensor and can/will pull timing if the temps are too high - you don’t want that for obvious reasons. Have at it guys and good luck... I'm just giving you another perspective to consider. Depends on where you live... earlier this week it was pushing 90 here - and it's not summer.